Women's, Coed, and Men's tournaments in fabulous Las Vegas, Nevada! Both annual women's tournaments hosted by Orange County Women's Soccer League - proceeds from the Gianetti Cup (formerly Pot o' Gold) tournament support the OCWSL Scholarship Award Fund and donations to local schools' women's soccer programs! The Bay Area Women's Soccer League would like to invite you and your team to participate in the Annual Kelley Cup - held in June, in Campbell, California. Registration opens in March. Register early and take advantage of a discount off of the registration fee! Register your team by April 30th and only pay $550. After April 30th, registration will be $600. It's time to call your current and former teammates to form a team. We would love to see you all on the field this June. 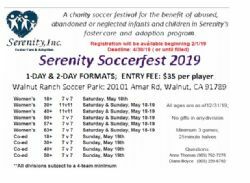 A women's charity soccer festival for the benefit of abused, abandoned, or neglected infants and children in Serenity's foster care and adoption program. Typically held in May in Walnut, CA.